Patagonia’s new ad for the next iteration of their plant-based Yulex wetsuit for Fall/Winter 2014-15. Click for larger image. When Patagonia started making wetsuits in 2006, the aim was simple: build the best possible suits in the least damaging way. The most environmentally harmful aspect of a wetsuit is neoprene, a synthetic, petroleum-derived material with a highly toxic manufacturing process. 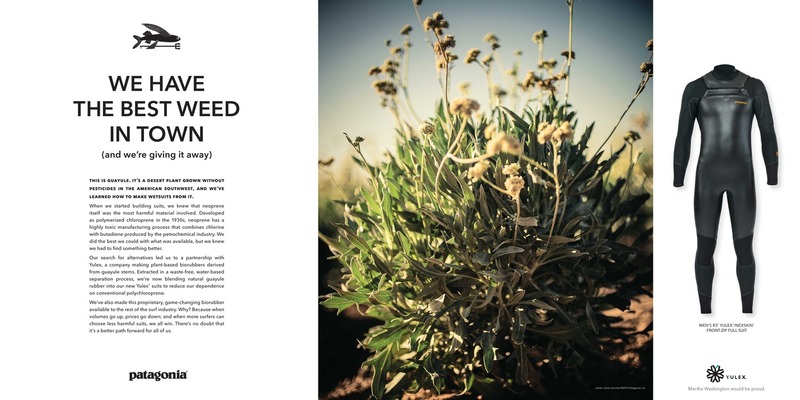 Patagonia’s search for alternatives led to a partnership with Yulex, a company making plant-based biorubbers derived from the guayule plant. Patagonia is now makings its Yulex wetsuit in a 60/40 blend (60% guayule, 40% neoprene), reducing dependence on conventional neoprene. Product-wise, for Fall 2014, Patagonia will expand its Yulex offering to include both R2 and R3 front-zip styles. These suits will have the added advantage of Nexkin® smoothskin – an ultradurable windproof coating that takes performance to the next level. Patagonia’s Yulex wetsuit with Nexkin technology represents the only environmentally friendly wetsuit on the market with Nexkin technology.